Fall is a time for harvests, colourful scenery, and a slight nip in the air. 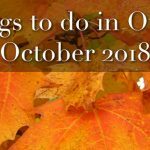 This is a great time to spruce up the indoor and outdoor appearance of your home, with all sorts of fun ways to add some fall-appropriate décor! 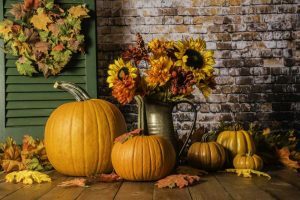 Whether you love to celebrate Thanksgiving in style or want to make your home even warmer and inviting as the cold weather sets in, we can help: Here are some fun home décor ideas you can try out this fall! They serve as a fun way to spruce up and refresh how your home feels as the seasons change. 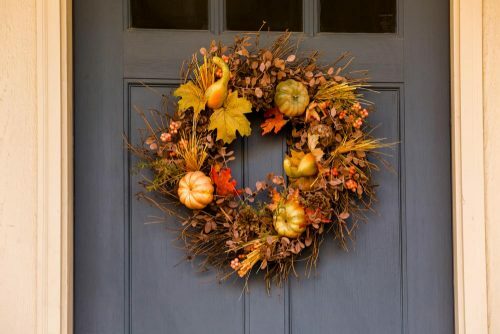 A well-placed homemade wreath with beautiful red, orange and yellow flowers is a lovely way to make your home fall-ready from a décor standpoint. Dried wheat and berries, twine and harvest plants can make it stand out even more as well – nothing beats a rustic, farm life look! Another neat idea is to take outdoor fairy lights and twine, bind them together, and then follow the edge of your front doorframe. Plug the lights in and presto: you have an enchanting fall-themed entryway! Now, who doesn’t think of pumpkins when they hear fall is coming? Pumpkin-spiced everything (and we mean everything) is a common annual trend that’s becoming quite the tradition. That being said, any home will look fall-ready if it has a pumpkin arrangement on the front porch beside the door! You don’t necessarily need to make jack-o-lanterns either (though that indeed is a lot of fun in itself) – having brightly coloured harvest veggies such as pumpkins can make your home more comfortable and inviting! If you’re going for a modern and elegant approach without wanting to change too much, a fresh lick of paint or new artwork around the house can make a big difference as well. Try going for earthy, harvest-style tones such as light brown, burgundy, and grey – it may not sound exciting, but you’d be surprised how sharp your home will look accented with wall décor and paint that fits so nicely with the current season. Fall is all about colour as well, so on the flip-side, don’t be afraid to indulge in yellows, earthy pastels and other bright colours that can make your home feel warm and welcoming. From gourds to lush flower arrangements, a well-designed centrepiece is an excellent addition to any home in the fall! First, stop in at one of Ottawa’s many wonderful florists to get started or even for design tips. Mood Moss Flowers on Beechwood Avenue, Langdon’s Flowers Ltd. on Bank and Pretty Pots in Stittsville are just a few of the many great places to stop in and plan your centrepieces! Add standout elements such as candlesticks, gourds, or a cornucopia to really get your dining room table noticed when company comes over. Whether you live in Rathwell Landing or Deerfield Village, or another Valecraft community, rest assured that there’s no shortage of great florists out there to help you create your dream centrepiece this season! Dark wicker furniture with playful fall-themed cushion designs (foxes and owls are always a nice touch in our eyes) can really liven up an outdoor gathering space such as a porch or deck. Well-made wicker tends to last quite a while also if you bring it in before winter hits! Comfortable, lightweight, and beautiful, wicker lends a natural presence to any room of your home. 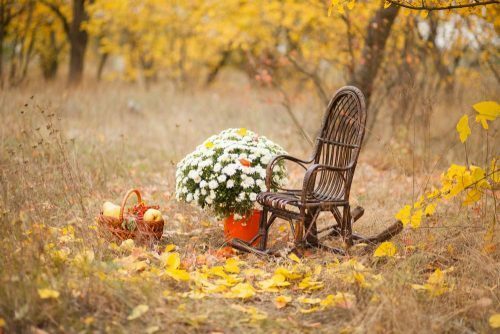 A wicker rocking chair is a fantastic addition to your porch, for example — can you picture yourself relaxing there with a hot apple cider and admiring the colourful leaves on a lazy Sunday afternoon? We sure can! Now here’s a style of décor explicitly created for families! 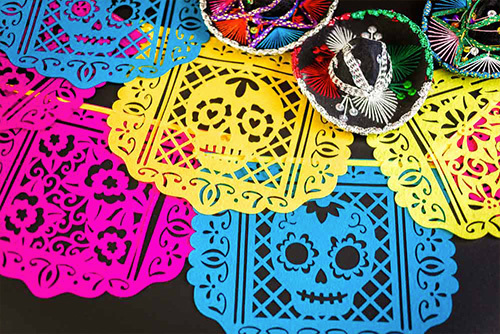 Día de Muertos — a much-loved holiday in Mexico and beyond — is like Thanksgiving but with even more energy and excitement! It’s an excellent opportunity to partake in papercrafts with the kids and make colourful hand-cut banners to string from the ceiling, and you can also put up pictures of loved ones to make it feel even more like home. You don’t have to add sugar skulls and skeleton imagery to your décor if you don’t want to either, rest assured. Instead, try coordinating colours and styles for a warm and welcoming home refresh that doesn’t feel cluttered or strange. You can also display some Latin cookbooks, which can pull double-duty to help you whip up delicious specialty foods such as churros, tamales, and enchiladas (are we the only ones getting hungry here?) for some fun meals with the family. Decorating with fresh marigolds — the symbolic flower of Día de Muertos whose petals are sprinkled to guide loved ones back home from the afterlife — is also a fun touch that’s colourful and exciting! This is also a décor style that can easily complement Halloween set-ups, and it’s easy to take down if you long to return to a traditional Canadian fall theme afterwards. 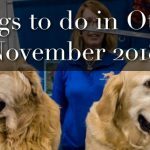 These are just a few of the many different ways you can decorate your home this fall for a fresh and welcoming atmosphere. What are some styles that you like to use? Are you someone who loves to make everything by hand for a rustic, one-of-a-kind home décor design, or do you want to use expert services to make your property look ultra-elegant? Sound off in the comments below, and happy fall to everyone!